Our extensive and diverse product lines set us apart, making AERO the preferred GSE supplier for over 16,000 organizations globally. Combine this with our team of professionally certified mechanics and engineers, revered customer service and an online parts store, and you have the best aircraft GSE supplier in the business. We stock a large selection of used, refurbished and zero-timed aircraft GSE. Our team of certified mechanics ensures equipment repairs are performed in accordance with manufacturer specifications. Equipment trade-ins are available. If we don’t stock it, we’ll find it. Ball Lock Pins, N2 & O2 Boosters, Regulators, Tug Hitches, GPU Cables, Adapters, Couplers, Connectors, Hoses, Deice Fluid, Engines, Pumps. The Parts & Supplies Department is ready for your GSE Parts request. 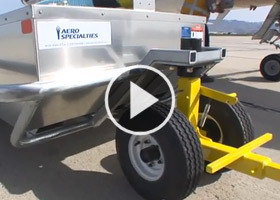 We supply and stock a large assortment of TLD Aircraft Ground Support Equipment. TLD GSE is available in new, used, or refurbished condition. We also supply rentals on TLD GSE. From tow tractors to beltloaders, GPUs and more – we carry it all.